A way to ask What [...]? in French is to use the expression Qu'est-ce que [...] ? followed by your statement in the normal order. Note also that you use qu'est-ce que if it appears at the start but quoi at the end. Tu veux du thé ? - Quoi ? Do you want tea? - What? Tu veux du thé ? - Comment ? 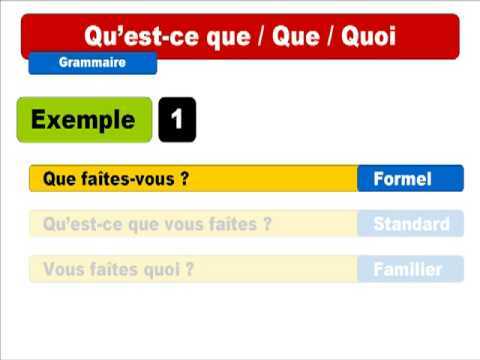 While qu'est-ce que means what ..., est-ce que introduces a YES or NO question (is it that...). Que can be used at the start, but the statement will then be inverted (it's a more formal way of asking questions). There is a typographical error in this lesson. "Instead, we'll consider more polite to use "Comment ? ":"
What's the typo in that sentence ? Should it say: We'll consider it more polite to use "Comment ?" In my quiz question it began "Qu'est-ce que tu ....." and I answered "What .." but it showed the correct answer to begin with "Who .." I can't see how that is correct. "Qu'est-ce que s'est passé?" -- What happend. "Qui est-ce que tu as rencontré" -- Whom did you meet? Que = what. The final "e" gets nixed when followed by the "e" of "est". Qui = who. The final "i" is impervious to the vowel that succeeds it. -- Chris (not a native speaker). I was taught that to ask 'what' when you didn't understand what was just said, you would say, 'comment?' Is this correct or should I say 'quoi?' instead? Bonjour Cameron ! This is indeed considered as more polite to use "Comment ?" rather than the blunter "Quoi ?" when asking "what?" in French. However, this only applies to asking "What? ", and in any other more developed questions, "comment" reverts to its actual meaning of "how". I hope it's helpful! À bientôt ! I've been told both work.